For This Reason a Man Shall Leave His Father and Mother…..
Dominic and Sarah’s wedding was wonderful! The weather was perfect, the High Mass was beautiful, the music was inspiring and the couple looked lovely and happy! I wanted to share with you these pictures. Most of them are taken by me. The newlyweds will end up having beautiful pictures and I may share some at a later time. You will see in the following pictures the Marriage Crucifix. This Tradition was just introduced to us and Dominic and Sarah used it in their Nuptial Ceremony. I wanted to include a link to show you what it was about so I googled it. I found a great article on it and lo and behold!…the picture they used in their article was of my first daughter’s wedding. I have seen this particular picture so many times used in Traditional Catholic Wedding articles! Neat! Anyway, here is the link. It is a lovely custom, you WILL want to know about it! Getting ready! Virginia made the pew bows. Virginia purchased a plain $8.00 hat from Ebay and added the embellisments. She made the flowers. This is the hat she wore for the wedding. Virginia made the bouquets, Theresa did all the corsages and boutineers. Vincent did the altar arrangements. They were all so beautiful! Just before we left the house. Waiting for the Bridal Party processional. Son-in-law Mike and daughter, Margy. Son, Angelo and sweet flower girl. Presenting her to the groom…. Margy and Bernadette (sister of the bride). Emma looks very guilty. She loves shoes and was doing a “shoe-switch” with Agnes at the wedding. Son-in-law, Vinnie and grandson, Nathaniel. Don’t forget to sign up for the Giveaway for my book and the bracelet! I will pull the name from the hat Tuesday, May 10th! What a beautiful day! Congratulations to all. thanks for sharing the pictures. Very very beautiful, you are a very blessed mother and grandmother!!!!! Congratulations!!!! I have one calendar that has the Feast of our Lady of the Seven Joys on this past Saturday. A feast apparently honored/started by the Franciscans. What a lovely day to be married, congratulations again!!!! The colors are stunning, everything was so vibrant!!!! Hi Mary, Sorry I was tardy on this reply. 🙂 No, Virginia doesn’t have an embroidery machine. The skirt to the little dress she made Emma was a skirt she ordered for herself off of Ebay. It was too short so she remade it into a dress for Emma instead. 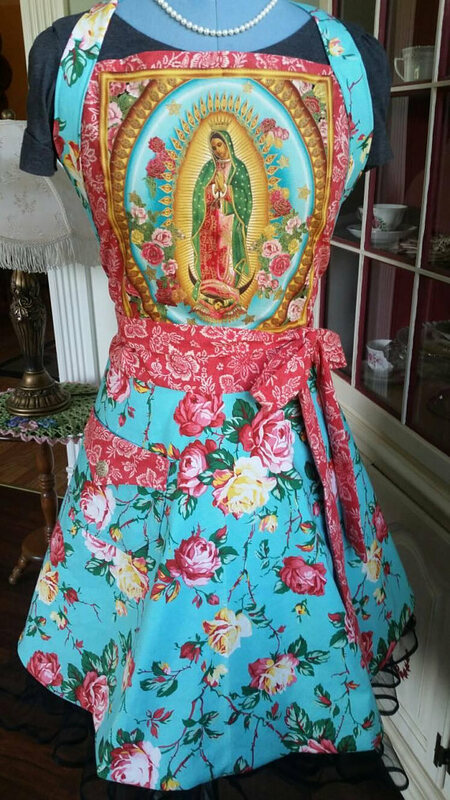 It already had the lovely embroidery on it. Thank you for sharing the custom. I was crying while reading about it. I don’t think you saw my question in my post above. 😉 If you have a moment I am very very interested to find out if she has an embroidery machine. I have been looking into the different makes and models and it really helps hearing from ladies who have used one and what they like or would like better. 🙂 Look forward to hearing more about it. 😀 Thank you! How beautiful ! Congratulations ! Prayers for the newly married couple !